Water depth is widely recognized as an organizing factor in lentic ecology that separates habitat types. We identified five bathymetric thresholds that were related to littoral energy, aquatic vegetation extent, stratification limits, and light extinction. 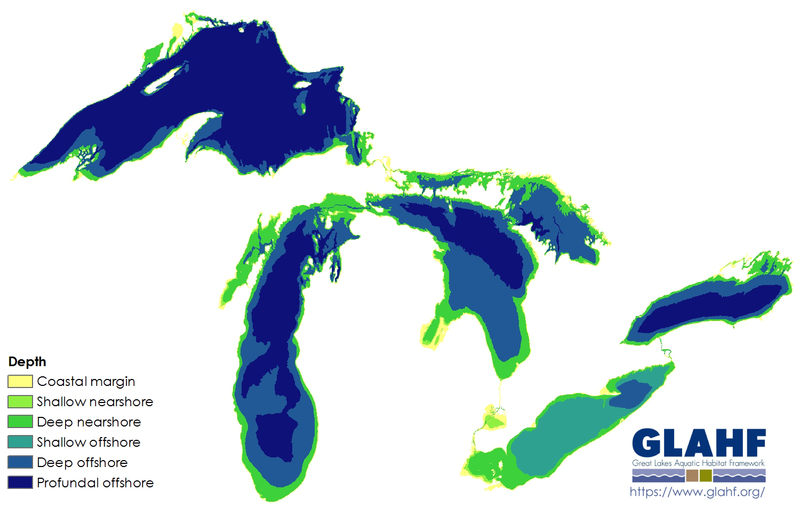 We defined the extent of the nearshore zone as < 30 m depth contour in all Great Lakes, except Lake Erie where we used the greater of a 15 m depth contour or 5 km from shore to capture the well-mixed zone. A zone unique to Lake Erie, the shallow offshore, was defined as occurring between 15 m and 30 m due to a difference in currents and variation in the extent and depth of annual summer stratification (Rucinski et al. 2010). In the offshore (> 30 m depth) we defined two zones: deep and profundal. The deep offshore zone was defined as the region from 30—100 m in depth. The 100-m depth represents 1% limit of light penetration (Wetzel 2001) and where the photosynthesis to respiration ratio is < 1. Depths greater than 100 m were classified as the profundal offshore zone. Bathymetric data were obtained from the National Oceanic and Atmospheric Administration (NOAA) National Centers for Environmental Information (NCEI). The original raster in 3-second resolution (approximately 90 m) was standardized to the GLAHF framework grid and anomalous depth values incongruous with depth data from the NOAA Nautical Chart 14968 were removed. The 0-m depth was defined using the jurisdictional Ordinary High Water Mark (U.S. ACOE 1985), which was integrated with the high resolution shoreline including island polygons greater than 10 ha (Forsyth et al. 2016) and enforced as the land-water boundary.